I hoped he actually had a freakish quantity of digits. Dr. Seuss (Theodor Geisel) is a treasured part of our cultural consciousness. He wrote and drew seemingly hundreds of books for children, taking them through basic language lessons and whimsical diversions to allegorical fables of tolerance and equality. Say “one fish, two fish” to someone raised with English as a first language, and they’ll probably reply immediately with “red fish, blue fish”. (I would also believe this to be true for the speakers of the dozens of languages into which his books have been translated.) Seussisms are a shorthand language that we reference freely in the certainty of being understood. Even if someone doesn’t instantly recognize the word sneech, within five words of explanation they remember the story of the sneeches having stars placed on and then removed from their bellies in order to appear superior to each other. 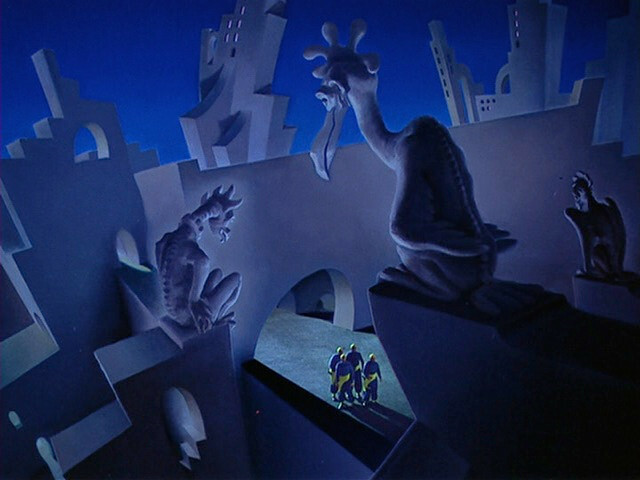 What most have forgotten, if they ever knew of it at all, was that the first live-action Seuss film was The 5,000 Fingers of Dr. T.
The movie’s plot is almost non-existent, but that’s hardly a factor for a Seuss outing. 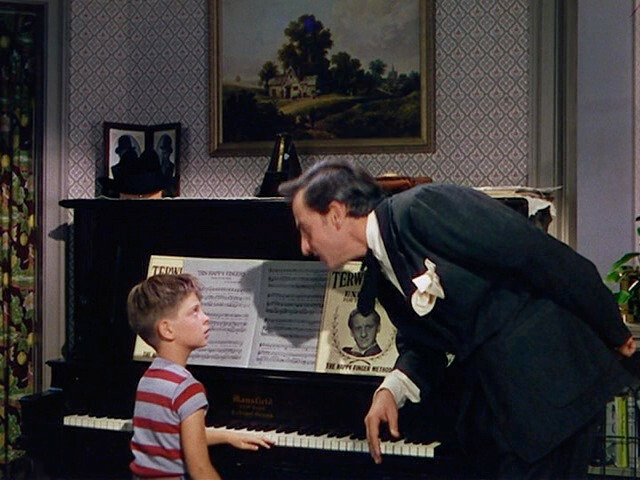 Young Bartholomew Collins (Tommy Rettig) hates his piano lessons, administered by Dr. Terwilliker (Hans Conried). Bart believes that his mother (Mary Healy) has been duped by the music teacher. He also believes that the plumber is should be his new dad, which raises the question of how often Collins house has pipe problems. Dr. T.’s Happy Fingers Institute, electrified for your protection. The majority of the film — the part you actually want to see — is a dream in which all of Bart’s thoughts play out in grand loopy fashion. In Bart’s dream, he’s the first student in Dr. T’s piano-teaching gulag, the Happy Fingers Institute. The doctor is running some kind of ill-defined racket that involves 500 boys playing his custom piano. 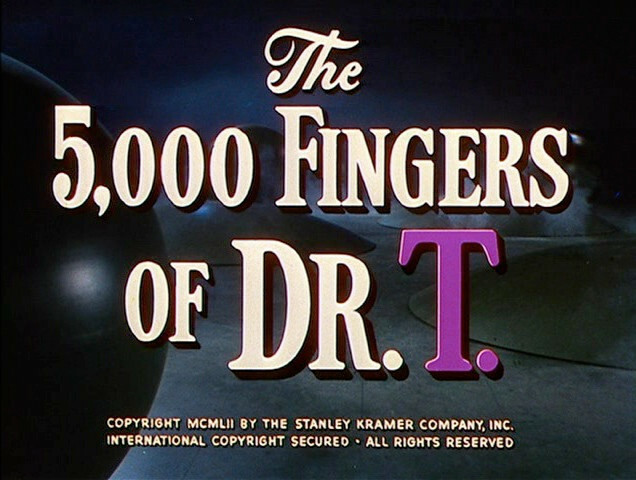 At 10 fingers each, we get the 5,000 fingers of Dr. T! Dream Bart wants more than escape; Dr. T has placed Mrs. Collins under a spell, and he plans to marry her as soon as the Institute opens. Bart needs to free her, but everyone at the Institute is against him — everyone, that is except for the contracted plumber August Zabladowski (Peter Lind Hayes). 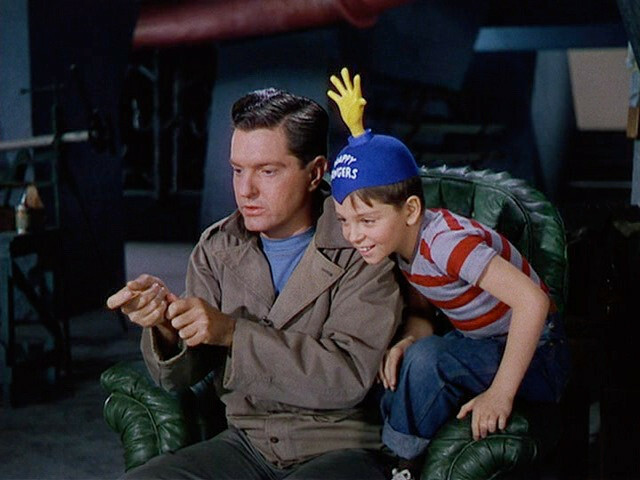 August is inclined to help Bart, but he also thinks the boy is embellishing the truth. The scenario captures the grandiose helplessness of childhood. The forces arrayed against Bart, the congenial distrust of his word, the mandated activities that he can’t stand — this is a world that must of us can recall from our youth. 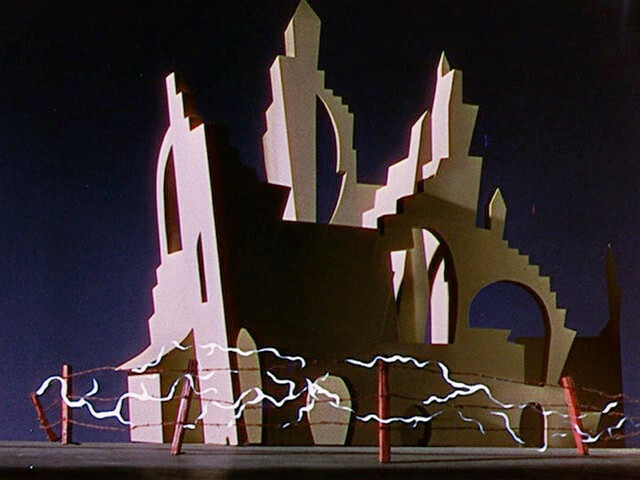 The erratic angles and looming architecture of the Institute amplify the sense of imprisonment within a massive and irrational system. 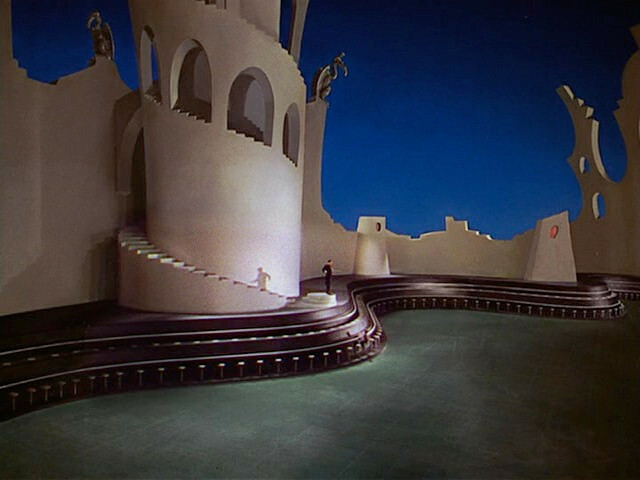 Thematically and visually, the film is perfectly realized allegory. 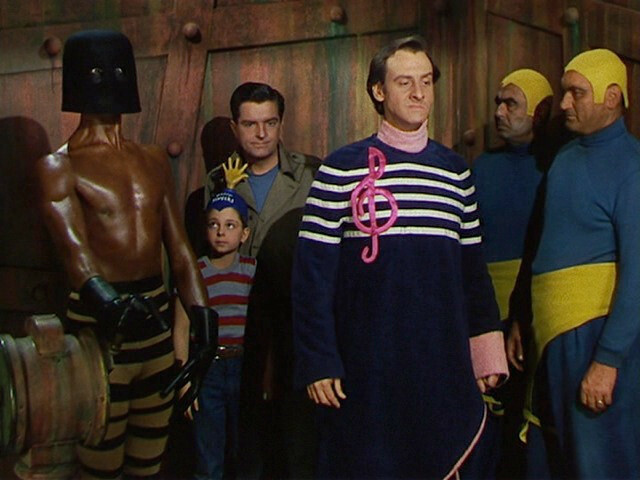 Hans Conried is wonderfully flamboyant in the role of the larcenous Dr. T. He’s a larger-than-life villain, in control of everyone but himself. He’s the embodiment of the capricious rules and unclear goals that children see in adults, and even Bart knows that everything would make sense if the other adults could break free of Dr. T.’s control. Heloise’s work-and-evening gown is hella cool. I’m roughly 70% in love with this movie. The things I like about it, I really like. There are roller-skating twins, attached at the beard. While Bart’s in the dungeon, he comes across a captive orchestra that dances and performs stunts. At one point Bart and August pretend to fish as imaginary son and father. At least it’s not noodling. There’s a lot in its favor. Unfortunately, it’s a 1950s movie, and that requires 1950s parents. Healy and Hayes do as well as can be expected, but the sad fact is that the experienced hand of co-writer Alan Scott is a disservice to the movie when it comes to the characters of Heloise Collins and August Zabladowski. 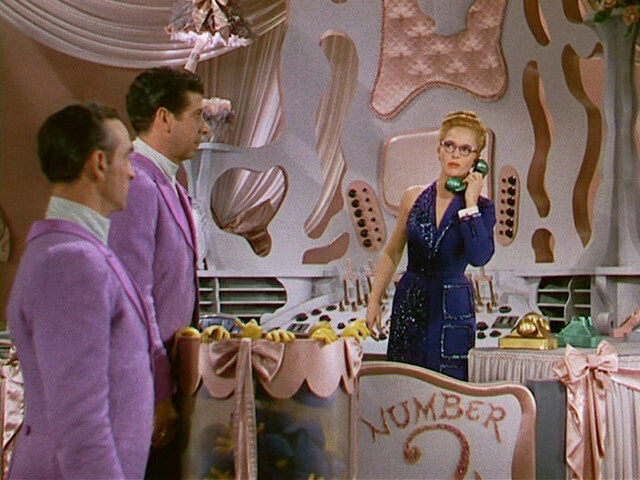 Scott wrote what Hollywood wanted: romance, comedy, drama, musicals. He co-wrote Top Hat , which is no small credit. It’s just that the last thing this flight of fancy needs is Wonderbread mother and father figures. August gets to do cool things now and then, but he almost literally has no personality. He’s purely reactionary, a boulder that Brad and Dr. T. shove on occasion. Heloise fares even worse. 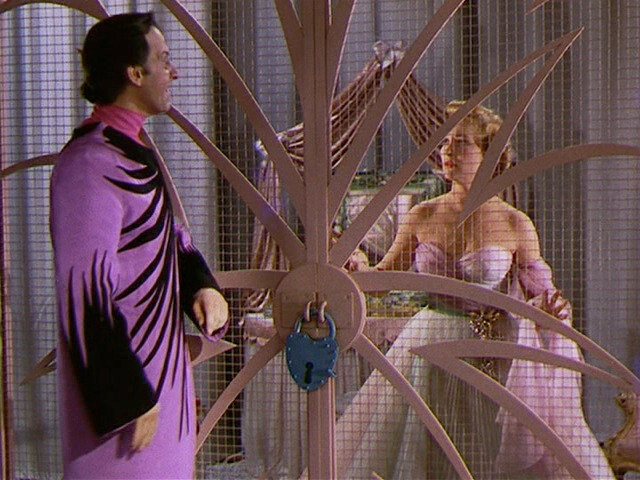 She’s a trophy to be won, a bird in a gilded cage, and sadly typical of a lot female roles to this day. i can’t even make a joke about this. It’s a movie worth seeing, but it doesn’t rise above its time. That’s going to be a problem for some viewers, although it isn’t nearly as bad as other kids fare from the period. If you can look past that, <cite>The 5,000 Fingers of Dr. T.</cite> isa lot of fun. It’s heads and tails above the live-action Seuss adaptations made more recently, even if most of the songs are pretty bland. At least there’s a grand number about getting Dr. T. dressed for his big day. This review is part of the “You know, For the Kids” roundtable of reviews by The Celluloid Zeroes. We’re taking a look at kids movies because, well we just wanted to. Please check out the reviews by the others. This movie used to be shown at special screenings at very early D&D cons in the Seventies (they didn’t have film rooms like regular SF cons of the time). The scene all the gamers went for was the elevator ride “FIRST FLOOR DUNGEON! …” scene. That song got filked so much….